This is for all the cookie dough lovers out there. You know who you are. Your mom let you lick the bowl growing up, and now you’re addicted… Hopelessly addicted, in fact. So addicted that you are willing to brave the dangers of (gasp) raw eggs when you make cookies at home, and that empty-ish bowl with those delicious dough remnants is just staring at you… taunting you. Well, here’s to you- from another person who ate cookie dough with raw eggs in it…. and survived. Alas, I have good news for all of you who are too nervous to sample raw cookie dough with eggs in it. 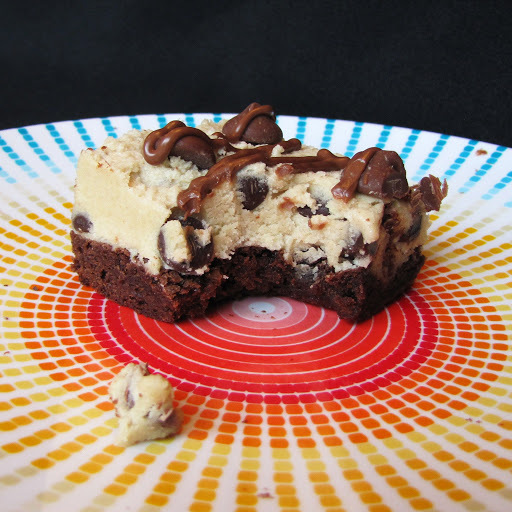 The cookie dough in this recipe has NO eggs in it- That’s right, it is raw egg free. When you aren’t going to bake the dough, you really don’t need the eggs, so, we leave them out. 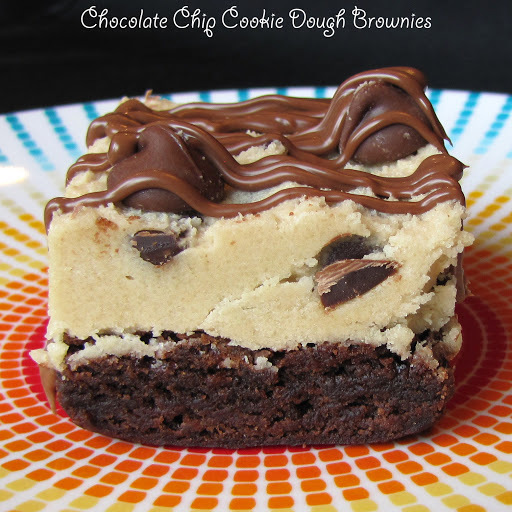 * I followed this brownie recipe for mine, but if you are under a time crunch, there would be absolutely nothing wrong with making a boxed 9×13 inch brownie mix and then skipping ahead to the cookie dough. If you’re using a boxed mix, follow directions on the box. If you’re using the homemade brownie recipe, here are the directions. Preheat oven to 325 degrees F. Spray a 9×13-inch pan with nonstick spray. In a medium glass bowl, melt chocolate in the microwave in short bursts of 30 seconds; stir after each burst and remove from microwave when melted and smooth. Set aside to cool slightly. In a large mixing bowl, whisk together the butter and brown sugar. Add the eggs and vanilla extract and whisk those in too. Mix in melted chocolate. Whisk in the flour and mix just until combined (don’t over-mix). Stir in the chocolate chips. Spread batter into prepared pan. Bake 25 to 35 minutes. Watch closely and remove from oven when toothpick inserted into the center comes out clean. Let cool completely. Prepare the cookie dough: In a medium bowl, use an electric mixer to combine butter, brown sugar and white sugar. Mix in milk and vanilla. Mix in flour just until combined. Stir in chocolate chips. Spread cookie dough over the cooled brownies. Refrigerate until the dough is quite firm. It’s okay to speed up the process and place it in the freezer too. The firmer the dough, the easier it will be to cut into neat squares. Use a sharp knife to cut the brownies. You may need to wipe the knife off with a paper towel in between cuts since the fudgy brownies and cookie dough will tend to stick to the knife a bit. These brownies are best to serve placed inside cupcake papers and served with a fork. If you’d like to add chocolate drizzle on top, melt 1/2 cup chocolate chips with 1 teaspoon of shortening in the microwave; stir until smooth. Scoop the melted chocolate into a zip baggie and snip off the corner. Squeeze the bag to drizzle the chocolate on top of each brownie. Sprinkle additional chocolate chips on top, if desired.